THE WRITING BUDDHA - Opinions | Books | Movies: I Still Think about You by Arpit Vageria (Book Review- 2.75*/5) !!! 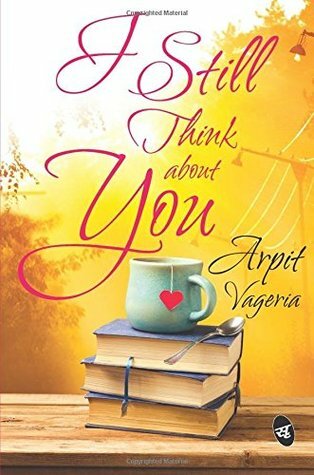 I Still Think about You by Arpit Vageria (Book Review- 2.75*/5) !!! I know Arpit Vageria as a cool person who is ready to try his hands into anything that's possible for him to do. I have seen him write articles, books and even pose as a model and also act in small videos. He is an all-rounder. I missed reading his previous books but managed to put my hands upon his newly released book named "I Still Think about You". This 178-pages novel is published by one of my favorite, Srishti Publishers. The novel basically speaks about brotherhood, tragic events in family, a new-found love and a person's dedication towards relationships. Arpit Vageria's writing style is very simple which makes this book a light read just like other several books of Srishti. Arpit's lifeline in this book has been the way he develops his character which gives them life and because of which you manage to understand the trauma and dilemma each one of them are going through. When you are using few characters as cameo, it becomes very hard to give them a good background in the few paragraphs in which you are describing their personality but Arpit have managed to do it very well. The love between the two brothers is beautifully portrayed in this book. Author have written those sections with purity which makes few moments of the story more emotional than they are. Talking about the drawbacks of this book- I would say that the book is very much on the tragic side and author have just kept pulling it more into the depth of sadness which makes it very boring most of the times. I was expecting some great moments in the 2nd half when Dhruv returns back to Mumbai but author has kept the whole thing directed towards tragic story of another character. Also too much death one after another makes it quite repetitive and you stop feeling bad for the characters after a point when death of their closed ones is discussed. Overall, I would say that the book is a fine attempt but it could have been much better considering the plot author had chosen. I give this one 2.75* out of 5.